Our vision is to be the international jack-up contractor of choice with a sole focus on shallow water drilling and a fit-for purpose business strategy. 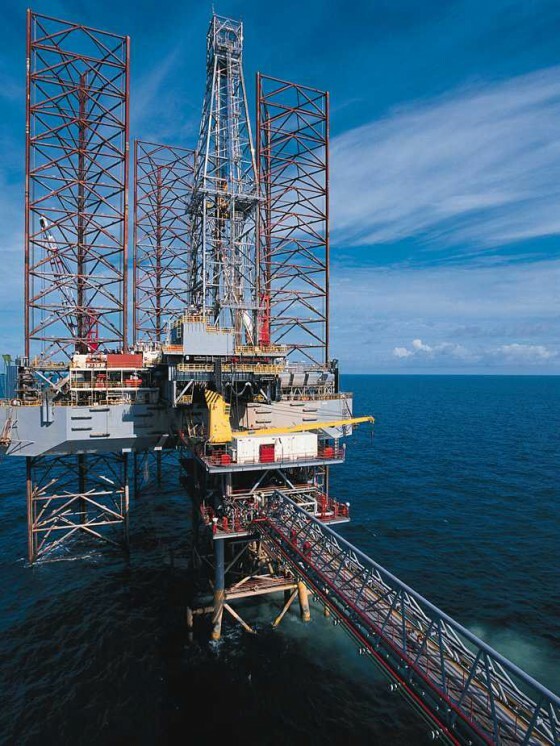 Shelf Drilling is the world’s largest contractor of jack-up rigs. We are incorporated under the laws of the Cayman Islands with Management headquartered in Dubai with rig operations across four core operating regions – Southeast Asia, India, West Africa and MENAM (Middle East, North Africa & Mediterranean). Our strategy is to maintain a sole focus on shallow water drilling services and leverage decades of industry experience and an outstanding track record to provide best-in-class drilling operations for our customers. Shelf Drilling’s dedicated focus on jack-up rigs, geographic diversity, safe operations, customer relationships and experienced management team make Shelf Drilling the preferred choice for customers, employees and stakeholders. Certain features of our Wesbite allows you to submit information and materials to us. When you submit such information and materials , you must comply with the content standards set out herein. You warrant that any such contribution does comply with those standards, and you indemnify Shelf Drilling Holdings Ltd. for any breach of that warranty. Any material you submit through our Website will be considered non-confidential and non-proprietary, and we have the right to use, copy, distribute and disclose to third parties any such material for any purpose. We also have the right to disclose your identity to any third party who is claiming that any material posted or uploaded by you to our Website constitutes a violation of their intellectual property rights, or of their right to privacy. We will not be responsible, or liable to any third party, for the content or accuracy of any materials submitted by you or any other user of our Website. We are the owner or the licensee of all intellectual property rights in our Website, and in the material published on it. The Website and these materials are protected by various intellectual property rights, including copyright laws. All rights are reserved. Such materials include but are not limited to design, text, graphics, files, photographs, video and audio clips, and the selection and arrangement thereof. Shelf Drilling Holdings Ltd. authorizes you to view and use the Website, provided that materials cannot be modified, or published in any media without the prior written permission of Shelf Drilling Holdings Ltd. The use of automated systems (robots, spiders, or any other data-mining or similar data-gathering and extraction tools) to access, acquire, or download information on this Website is expressly prohibited where such systems are employed in connection with commercial objectives. The words "Shelf Drilling Holdings Ltd.", the Shelf Drilling Holdings Ltd. logo, and the names and logos of products and services described in this Website are either trademarks, trade names, or service marks of Shelf Drilling Holdings Ltd. and its licensors, or are the property of their respective owners. You may not copy or use these marks, or any marks that are confusingly similar, in whole or in part, without the express prior written permission of Shelf Drilling Holdings Ltd. or the respective owners of the marks. If such permission is granted, you must provide proper acknowledgment each time you use the mark. In addition, page headers, custom graphics, button icons, and scripts may be service marks, trademarks, or trade dress of Shelf Drilling Holdings Ltd., and are subject to the foregoing terms and restrictions. Shelf Drilling Holdings Ltd. makes no claim or representation regarding, and accepts no responsibility for, the quality, content, nature, or reliability of Websites accessible by links from this Website, or Websites linking to this Website. We will not be liable if for any reason our Website is unavailable at any time or for any period. From time to time, we may restrict access to some parts of our Website, or our entire Website, to users who have registered with Shelf Drilling Holdings Ltd. When using our Website, you must comply with the provisions set out herein. Any liability for any direct, indirect or consequential loss or damage incurred by any user in connection with our Website or in connection with the use, inability to use, or results of the use of our Website, any websites linked to it and any materials posted on it, including, without limitation any liability for loss of income or revenue; loss of business; loss of profits or contracts; loss of anticipated savings; loss of data; loss of goodwill; wasted management or office time; and for any other loss or damage of any kind, however arising and whether caused by tort (including negligence), breach of contract or otherwise, even if foreseeable, provided that this condition shall not prevent claims for loss of or damage to your tangible property or any other claims for direct financial loss that are not excluded by any of the categories set out above. Breaching this provision may constitute a criminal offense. We will report any such breach to the relevant law enforcement authorities and we will co-operate with those authorities by disclosing your identity to them. In the event of such a breach, your right to use our Website will cease immediately. You may not link to our Website in any way to suggest any form of association, approval or endorsement on our part where none exists. If you wish to make any use of material on our Website other than that set out above, please address your request to info@shelfdrilling.com. Materials posted by us on our Website are not intended to amount to advice on which you should rely. We disclaim all liability and responsibility arising from any reliance placed on such materials by any visitor to our Website, or by anyone who may be informed of any of its contents. We may update our Website, including by changing the content at any time. We may suspend access to, or shut down, our Website at any time. Any of the material on our Website may be out of date at any given time, and we are under no obligation to update such material. Any technical questions or comments about the Website should be addressed to our Web Team, please contact info@shelfdrilling.com. For other communications, direct as indicated in the following paragraphs. This is the privacy statement of Shelf Drilling, Ltd, and its wholly-owned subsidiary entities, whether direct or indirect (collectively, “Shelf Drilling” or “we” or “us”). In this privacy statement references to our website refers to https://www.shelfdrilling.com/. Shelf Drilling is located at One JLT, Floor 12, Jumeirah Lakes Towers, P.O. Box 212201, Dubai, United Arab Emirates. The addresses of our other offices are set out at: https://www.shelfdrilling.com/contact-us/. • the internet and social networking sites, such as LinkedIn. • details of how you like to interact with us, and other similar information relevant to our relationship. • the processing is necessary for the establishment, exercise or defence of legal claims. If you choose not to provide, or object to us processing, the information we need, we may not be able to deal with you to provide some or all of our services or information to you. • prevent and detect crime, fraud and corruption. We may also use your personal information for marketing purposes with your consent or where applicable data protection laws and regulations otherwise allow. We do not process personal information by automated means. We have provided some examples of our use of your personal information below. - where permitted under applicable data protection laws to do so, to keep you informed, through electronic communications or otherwise, about relevant services and provide you with information about us, unless you have indicated that you do not wish us to do so. • potential or actual purchasers of the business (or a part thereof), or other third parties in the context of a possible sale or restructuring of the business. We process personal information in countries around the world where have operations. If you are within the European Economic Area (EEA), we may transfer your personal information to countries outside the EEA for the purposes of carrying out our obligations under our contract with our customers/vendors, to operate our business, and/or to comply with legal obligations. Some of the countries outside the EEA in which we operate, are not covered by an adequacy decision by the European Commission which means that such countries are not deemed to provide an adequate level of protection for your personal information. However, in such cases, we will take appropriate measures to safeguard your personal information in a way that complies with relevant data protection laws. These measures may include approved standard data protection clauses, binding corporate rules, and/or the EU-US Privacy Shield Framework. In general terms, we will retain personal information about you for the duration of our relationship with you and afterwards for any period required by applicable law or until the time period in which legal claims could be brought has expired. In a global organisation such as ours, the rules that apply to determine how long it is appropriate to hold records for particular matters can be complex and varied. If you wish to know how long we may hold your particular personal information then please e-mail privacy@shelfdrilling.com. We are committed to complying with all applicable data protection laws that apply to our processing of your personal information. This privacy statement applies on a worldwide basis across our operations, unless it conflicts with the laws in any particular jurisdiction, in which case we will process personal information in accordance with those laws to the extent they apply. While this privacy statement is designed, in part, to satisfy the requirements of the EU General Data Protection Regulation (GDPR) and to apply standards which are generally consistent with it, this privacy statement does not create GDPR rights for individuals whose personal information is being processed outside the scope of the application of GDPR. • Access to your information – you have the right to request a copy of the personal information about you that we hold. • Correcting your information – you have the right to ask us to correct your personal information if you believe it is not accurate, complete or up-to-date. - our use of your personal information is contrary to law or our other legal obligations. • Objecting to how we may process your information – you have the right at any time to require us to stop using your personal information for direct marketing purposes. In addition, where we use your personal information to perform tasks carried out in the public interest or on legitimate interest grounds then, if you ask us to, we will stop using that personal information unless there are overriding legitimate interest grounds to continue. - you have objected (as above) and are awaiting confirmation as to whether we have overriding legitimate grounds for processing. • Withdrawing consent for processing your information – you may withdraw your consent for the processing of your personal information at any time in which case we will stop processing your personal information for the purpose(s) for which consent was given. If you have any questions about this privacy statement, wish to make a complaint about how we are using your personal information or wish to exercise any of your rights you can contact us by sending an email to privacy@shelfdrilling.com. Where GDPR applies to the processing of your personal information, you also have a right to complain to the EU data protection supervisory authority in your jurisdiction. We keep this privacy statement under regular review and will place any updates on our website. Paper copies of the privacy statement can be obtained by using the printer icon or by e-mailing us at privacy@shelfdrilling.com with your address. This privacy statement was last updated on 14 November, 2018. Shelf Drilling, Ltd, a company incorporated in the Cayman Islands (registration number 271054) and having its registered office at Centralis (Cayman) Limited, One Capital Place, 3rd Floor, George Town, Grand Cayman, Cayman Islands. This is the privacy statement of Shelf Drilling, Ltd, and its wholly-owned subsidiary entities, whether direct or indirect (collectively, “Shelf Drilling” or “we” or “us”). This privacy statement applies to individuals applying to work with us, including prospective employees and contractors. In this privacy statement, ‘personal information’ means your personal data – i.e. information about you from which you can be identified or are identifiable. This privacy statement explains how and why we will collect and use your personal information in the context of the recruitment process and your rights in relation to your personal information. We may amend this notice at any time. We may also collect, use and store other information which we may deem required to exercise an employment relationship (if applicable). We do not currently take decisions about individuals based solely on automated processing (i.e., without human involvement) which have a legal or similarly significant effect on them. We only collect these types of personal information where we need to and if the law allows us to do so. The legal basis that we rely on to collect special categories of personal information are detailed below. • other third parties where necessary to comply with legal obligations upon us. We process personal information in countries around the world where have operations. If you work in our operations within the European Economic Area (EEA), we may transfer your personal information to countries outside the EEA to operate our business and/or to comply with legal obligations. Some of these countries outside the EEA in which we operate are not covered by an adequacy decision by the European Commission which means that such countries are not deemed to provide an adequate level of protection for your personal information. However, in such cases, we will take appropriate measures to safeguard your personal information in a way that complies with relevant data protection laws. These measures may include approved standard data protection clauses (processors) adopted by the EC from time to time or binding corporate rules and/or the EU-US Privacy Shield Framework. If you don’t start work with us following the recruitment process, we will retain your personal information to allow us to establish, exercise or defend legal claims and, unless you request otherwise, we may retain that information afterwards in accordance the terms set out in our recruitment portal. If you start work with us following the recruitment process, we will give you a copy of our Employee Privacy Notice, and will retain your personal information in accordance with that notice. Correcting your information – you have the right to ask us to correct your personal information if you believe it is not accurate, complete or up-to-date. • our use of your personal information is contrary to law or our other legal obligations. Objecting to how we may process your information –where we use your personal information to perform tasks carried out in the public interest or on legitimate interest grounds then, if you ask us to, we will stop using that personal information unless there are overriding legitimate interest grounds to continue. • you have objected (as above) and are awaiting confirmation as to whether we have overriding legitimate grounds for processing. Transfer – if our processing is based on your consent or necessary to carry out our contract with you, and is carried out by automated means, you can request a copy of the personal information you have provided to us and the transfer of this to someone else. Where technically feasible, you can ask us to transfer it directly to another controller. Withdrawing consent for processing your information – you may withdraw your consent for the processing of your personal information at any time in which case we will stop processing your personal information for the purpose(s) for which consent was given. You may contact us in any of the ways set out in the Contact information, further advice and complaints section below if you wish to exercise any of these rights. If you have any questions about this privacy statement; wish to make a complaint about how we are using your personal information; or wish to exercise any of your rights, you can contact us by sending an email to privacy@shelfdrilling.com. This privacy statement will be subject to regular internal review and any updates will be placed on [insert link to webpage page where this statement will be posted]. Paper copies of the privacy statement may also be obtained by sending a request to privacy@shelfdrilling.com.